By now you would have enjoyed your Christmas celebrations, possibly spent time with your families and looking forward to the New Year like I am. I was asked at very late notice for some more Christmas cards and these are some of the ones I made quickly. The first one uses leftovers from our Paper Angels Christmas Card Workshop using the Hello December Project Life accessories kit. The cardstock here is Whisper White and Emerald Envy based on the Black card below. I made several of these. These next ones here show a basic card and then some stepped up versions with some added Reindeers. Luckily I had these prestamped in my stash, so they were quite quick to assemble and add to the card which used Real Red, Whisper White card and Dsp from the Presents & Pinecones paper pack. The Deer and wreath come from Santa's Sleigh bundle. The simpler card has Dazzling Diamonds glimmer. I have been making Christmas cards for months now. I've not been very up to date with posting them though, but here's a couple more I made. A very simple design using the Foil and the Tree framelit from the Santa's Sleigh set. The cardstock was Cherry Cobbler and Dapper Denim respectively and the patterned paper was an earlier retired one from my stash. Both of the cards went to good homes, lol. I really enjoy making and sending my Christmas cards. Have a very lovely Christmas everyone. Welcome to our challenge at the Paper Craft Crew this week. This one will run for a couple of weeks over the silly season to allow you all time to play and to enjoy the Christmas festivities. I have made my very last Christmas Card for this year and here it is using Pretty Pines Thinlits. This card also uses the Pine Bough embossing folder and "Joy" thinlit from the Wonderful Wreath set. Cardstock is Basic Black, Whisper White and Silver Glimmer. There is no ink at all on this card but there is plenty of texture. Thanks so much for joining us at the Paper Craft Crew. We look forward to seeing your creation in the Gallery and have yourself a Merry Christmas. 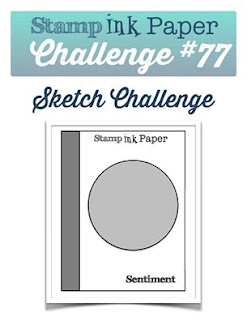 Welcome to our 2 week challenge at Stamp, Ink, Paper . 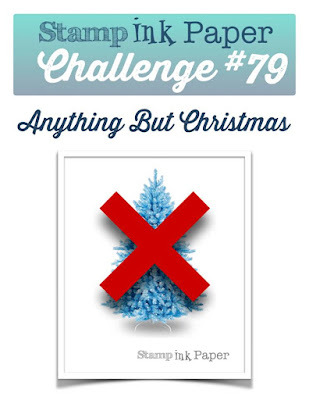 Now we love Christmas and are taking a little break to spend time with friends and family, but we would like to see something other than Christmas cards for this challenge. Anything else at all. That gives you plenty of scope, and plenty of time to participate given that many will be very busy in the hectic Christmas week. I made these couple of shaker cards for class recently. It was my breakup class of the year and the ladies were also keen to make something else rather than Christmas cards. The cardstock is Dapper Denim, Bermuda Bay, Soft Sky and Very Vanilla. The patterned paper comes from the pack called By the Shore. I've used the Banner punch and Thoughtful Banners stamp set for the greeting and the Oval framelits to create the window for my shaker. Thanks for joining us this week at Stamp, Ink, Paper. We look forward to seeing your creation. Have a fantastic day. 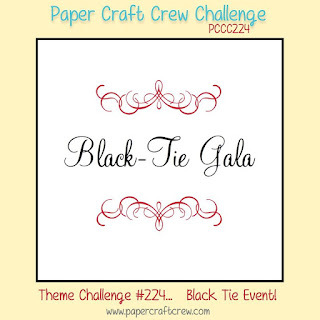 It's time for another challenge at the Paper Craft Crew. I am a little late with posting as we've been away on a short break to Melbourne, however you still have plenty of time to join in with this week's sketch challenge. I've used the Santa's Sleigh bundle and Holly embossing folder for my card. The cardstock is Mossy Meadow, Cherry Cobbler, Early Espresso, Very Vanilla, Crumb Cake and Red Glimmer paper. The patterned paper used is from "This Christmas" designer paper pack and the greeting comes from the Teeny Tiny Sentiments stamp set. I also used some of my retired punches here - The Scallop border, Word Window and Modern Label punch. We would love for you to join us this week at the Paper Craft Crew. Have a great day. This was a card made for my final class this year. The ladies enjoyed this one and credit for the Owl design goes to Bronwyn Eastly for this clever idea using the Petals & Paisleys bundle. I've used Whisper White and Night of Navy cardstock here and patterned paper from the Floral Boutique pack. The Navy background was embossed with Pine Bough embossing folder and the Birthday greeting comes from the Butterfly Basics stamp set. Here's the full view of the card . Thanks for stopping by. Please feel free to drop me a comment. I would really appreciate it and I love hearing from you. 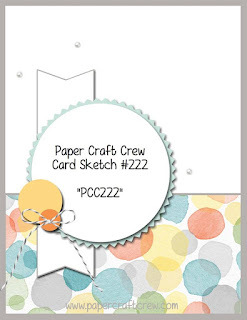 Welcome to the Wednesday Sketch challenge at the Paper Craft Crew. I am still making Christmas cards, so that's what you get today. This one uses Whisper White, Real Red, Mossy Meadow and Silver glimmer card and This Christmas designer paper. I've also used the Holly punch (Retiring) on this card. I've used my Layering Ovals framelits to highlight and mat the greeting from the Wonderous Wreaths stamp set and some Dazzling Diamonds paper was used for the banner. Thanks so much for joining us this week. Can't wait to see your creation for the challenge this week at the Paper Craft Crew. It's another Tuesday challenge at Stamp, Ink, Paper. Here is our sketch for the challenge this week. I'm still making Christmas Cards and here are another couple based on this sketch, similar but different sentiments using the Flurry of Wishes bundle. I used Whisper White Card for both with dsp from the Pinecones pack. This is the first one I made. and a closeup of that beautiful layered snowflake. This is the second one and the difference her is a strip of Dazzling Diamonds Glimmer paper down the stripe border and the Merry Christmas greeting.